Puglia is one of the southern regions of Italy, located in the heel of the boot. It is a region that has much to offer in terms of beach, culture and nature. Ideal for a stay in an agriturismo. In Puglia you are never far from the beach and the deep blue sea with beautiful seaside resorts like Otranto and Gallipoli in the province of Salento. Not far from your agriturismo in Puglia you can discover beautiful towns like Lecce, Bari and Taranto where you can fully enjoy culture. Certainly worth a visit are Ostuni, the white hilltop town, and of course Alberobello. 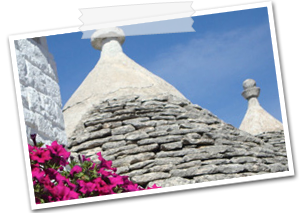 This is a UNESCO World Heritage site and famous for its trulli, small white houses with a conical roof, typical for this region. The agriturismo's in Puglia mainly produce olive oil and wine and the region is famous for the very tasty cuisine with its typical seafood. In the Puglia region an agriturismo is called "masseria", meaning farm or farmers' court. In an agriturismo in Puglia you can enjoy the southern Italian hospitality and the delicious local cuisine. The agriturismo's or masseria's that I have selected for you are rural located but also centrally situated in the Puglia region. This makes it easy to reach both the beach and the many beautiful towns. On my website myitalyselection.com you can view all agriturismo's that I have carefully selected for you. If you find it difficult to choose from this selection than I gladly provide you some advice. I have visited them all personally. You can book directly, I use the official prices of the agriturismo's. 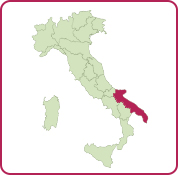 And if you do not find your agriturismo in the region of Puglia please have a look at the various possibilities in the regions Calabria or Sicily.